13.1 miles is just the start. 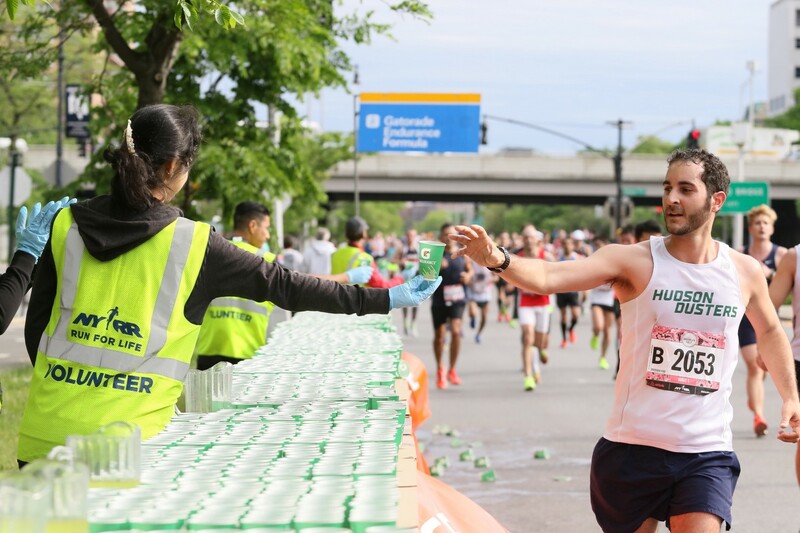 Along with 27,000 other people, I ran the Brooklyn Half Marathon on Saturday. The exasperated camaraderie that took hold after crossing the finish line was unlike anything I’d felt before. After those 13 miles, and sprinting the final leg, crossing the finish line gave way to the kind of disorientation you get after waking from a vivid dream. I followed the crowd of runners in dazed, childlike wonderment: Yes, I just finished the race. Then: Yes, I am at the boardwalk, this is Coney Island, the ocean’s right over there. Then: There sure are a lot of runners around me. Then: Look, there’s some people on stilts, giving very high high fives. Oh, an apple. Oh, some Gatorade. Seconds later: Oh, those runners are lying on their side doing stretches. That sure looks nice. Sit down. Bend into the quad that was complaining, try and stretch those hard-working calves. And realize: This thing I never even thought I’d be able to do, I did. I had been running casually — a jog of two to five miles, couple times a week — for years. Within a life rife with metrics, it was an untracked pleasure. But then, one January day, my former boss quietly Slacked me a reminder that the registration for the Brooklyn Half would open in a couple hours. So I signed up. Then, over the course of many weeks, I added distance and worked on tightening my pace. I’d go for eight, nine, ten, and finally eleven mile long runs on the weekend, plodding along the East River, admiring many angles on Lady Liberty, getting kind of lost in Red Hook. Went down from a nine to eight to under seven-minute per mile pace, depending on the length, and started to feel some confidence. I have this ridiculous, ongoing group iMessage with a couple fellow media bros, one of whom was also running the race, so of course we made a friendly bet: if he won, I had to shave my beard, and if he won, his baby face couldn’t see a razor for a week. Yet, despite my newfound swagger, I felt nervous before the race. So I tweeted at my favorite sports science writer, Brad Stulberg, who also writes for Thrive. His advice was simple: “Trust your training.” I had no choice but to embrace it: I’d already trotted 11 miles without hating myself at the end of it, and 13.1 couldn’t be that much further. I’d come to know how my body felt when tracking an eight minute pace, so I could tune into that level of effort, and trust that it would get me through. I was elated, and a little surprised, by how well I did, averaging 7:46 a mile for an hour and 41 minutes — beating my buddy by a cool 20 minutes. “The race is really the reward,” another friend, who’d finished a marathon or two, advised at a recovery barbecue. “You already put in all the work training all those months.” So trust it. Maybe it’s growing up in a hyper-competitive capitalist society, but I assumed an actual race — this was my first — would be more of a rat race. But the feeling in the air was more cooperation than competition: Yes, I course wanted to smoke the friend I’d made the bet with, but there was nothing but fellow feeling for my fellow competitors. It was kind of like rock climbing: your real opponent is the course. And oh, the families, friends, and wellwishers that came out — they ruled so intensely hard. “You can do this,” they commanded. “Yeah runners!” they shouted. “Keep it up!” they exhorted. And the signs! This hill is almost over! and If this guy can make it into the White House [photo of Trump] you can finish this race. So clever, so joyous. Also, if my adolescent interest in pro wrestling taught me anything, it’s that performers feed off of the crowd’s energy. So I high-fived the most amped of supporters, who in turn amped me up. I was so excited to receive their good will, and they were so excited to give it — it was a chain reaction of mutual stokedness. One sign in Prospect Park summed it up. Underneath a mushroom from Super Mario Bros, read the simple message: Touch here to power up. Remember that running is tai chi. Way back when I began my running odyssey, I wrote a story about how the best runners are astonishingly chill. I talked to several running coaches, all of whom happened to have a philosophy informed by tai-chi, the slow motion Chinese martial art. They impressed upon me that there were a handful of keys to flowful, positive, safe distance running. Item one: learn to distinguish between positive discomfort (muscles working hard) and negative discomfort (bones and ligaments getting overworked, risking injury). Item two: relax. The more tension that’s in a system, engineers will have you know, the more the rest of the system has to compensate, so you might as well make that system as fluid as possible, and make it easier on yourself. Item three: use the forces available, namely gravity. Over the course of training, I’d begun to get a sense of how tilting my torso forward just a bit would shift my momentum, outsourcing a portion of my self-propulsion to that most constant of companions. In a direct, non-metaphorical sense, if you learn to cooperate with laws of universe, they can lend you a helping hand.